​Locals of Dan Hono II popularly known as Millennium City, Chikun Local Government area of Kaduna State yesterday turned out in their numbers to protest what they called forceful taking over of their land by the state Governor, Nasir El-Rufai. This was coming ahead of Nigerian Vice President, Professor Yemi Osinbajo visit to the state this Wednesday. The protester, who were majorly women and children had came out to barricade the dual carriage road that linked the northern and southern part of Kaduna to draw sympathy from relevant stakeholders ahead of the Vice President Osinbajo visit to the state on Wednesday for another commissioning of mass housing estate on the controversial hectares of land. Addressing newsmen at the scene of the peaceful protest, Chairman, Land Owner Committee, Dan Hono II, Mansur Suleiman expressed worry over what he described as insensitivity on the priority of the current administration in the state saying, though they may not be able to stop the government from using their age-long land but, apart from relocating them to other place, they should be adequately compensated too. A copy of letter the community claimed to have written to the governor without response sought to have a meeting with all the stakeholders with the governor and that he (the governor) should use his good office to stop all private developers from carrying out any activity until the matter is amicably resolved. The protesters were with placards with varying inscriptions such as, “VP Osinbajo come to our rescue”, “We kick against forceful taking over of our land”, “This is not the change we voted for” among other. “We are not happy with what the state governor is about to do to us in this area. The state government is planning to give our land to private developers without relocating and pay us compensation due to every land owner here because some of us have already built houses on the land. “We have written four separate letters to the governor without result up till now. We don’t know whether the letters get to him but we believe that, there is no how he would not have come in contact with documents on our stand with his predecessors. It is sad that government we voted into power can still come back to frustrate the masses that voted because the reach he’s trying to enrich don’t even take part in voting”, added Suleiman. Also speaking, Hajia Larai Adamu who also owned property in the area lamented their hope after forceful eviction from the land without alternative for them and their children. 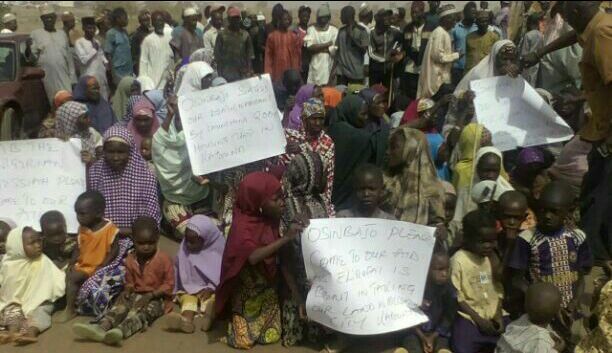 “See our children and our aged parents, where does he want us to go with current economic hardship in the country. We voted for this government to better our lot but the reverse is the case. What have we done to deserve this inhuman treatment, what is our offense? she asked. For Abdullahi Suleiman who owned six plot of land in the area, “The governor is too obvious in his way of treating some people far above others within the same community. For example, Ali Gussau farm is located within this area but he has pretended as if he did not see it but surveyed those that belong to common men who voted him into power. I risked my life to drive from here to Tudun Wada to vote for this governor in 2015 but he has chosen to pay us back this way. God will judge rightly, this we believe”.